This talented customer made their own columns using our 6' and 18' long diamond beaded curtains (and cutting the bead strands off of the rod) ! The effect is spectacular! You can also purchase square or round diamond columns pre-made in a 9 foot, 14 foot length or 20 foot length. 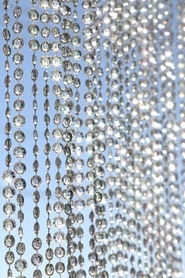 Make the items above using our diamond beaded curtains! We also sell a pre-made columnm but this customer chose to "do it yourself" and made them out of the strands from 6' and 18' curtains.